FOR SLALOM SETUPS: The Racetrack series was designed with slalom in mind. We like to pair the RTS 106mm with a Bennett 4.3 front for a good value slalom solution. Another traditional combo is RTX 106mm front paired with the RTS 106mm rear truck. Bushing combo upgrade highly recommended. FOR LDP: The RTS 129mm is a popular rear truck choice and makes a good pair with the Bennett 5.0 front. Bushing and wedging upgrades recommended. FOR FLATLAND FREESTYLE: The RTS is a good fit for flatland tech riding. The RTX has "indy-similar" geometry and is also a popular choice for freestyle set-ups. Choose the 106 mm size for the Primo Slide, Jester Retro, Diane Desiderio Pro, Keith Butterfield Pro or the 129 mm size for the 360 King Freestyle and typical street sized decks. Specs: All sizes come in silver aluminum finish with stock Tracker hourglass bushings. Each truck sold invidually. CUSTOM BUSHINGS: Proper bushing choice and truck adjustment can make a world of difference in your riding experience. Let us choose a specific bushing combo to suit your weight and intended discipline. We mix and match different duros and styles for optimum performance ranging from response to stability. Highly recommended upgrade option -- especially for slalom applications. Please provide the rider's weight and intended discipline in the notes section when choosing this upgrade option. BACKUP BUSHINGS: Fresh bushings can be essential for top performance. Order a backup set for your truck so you'll be ready to replace when needed. 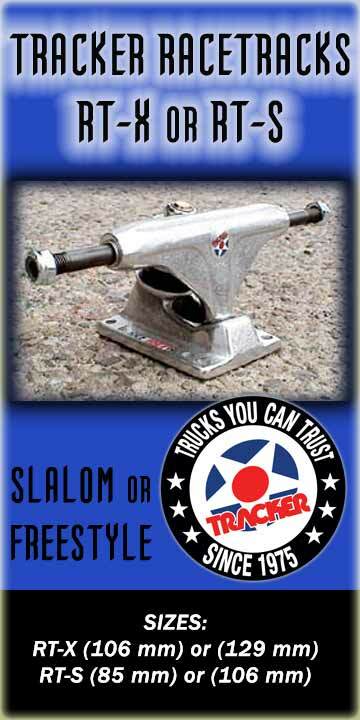 ABOUT TRACKER TRUCKS: Tracker Skateboard Trucks - founded in 1975 - were the first trucks designed specifically for skateboarding. More than twenty five years ago the Tracker engineers based their original design on performance, reliability, and durability. Today those three words continue to be the driving force of Tracker Trucks. Over the years, the original Tracker design has been copied by our competitors many times. Renamed and re-packaged, they all fall short in comparison to today's legendary Tracker Skateboard Truck. If dependability, performance and a long standing reputation for quality products is what you want, go with Tracker...trucks you can trust since 1975. (Courtesy Tracker Trucks web site). Tracker headquarters located in Southern California.